A professional website makes it easy to attract new clients. This suggests you will take equally good care of their project. You can make a great Creative Agency website in 2017 with the right WordPress themes. 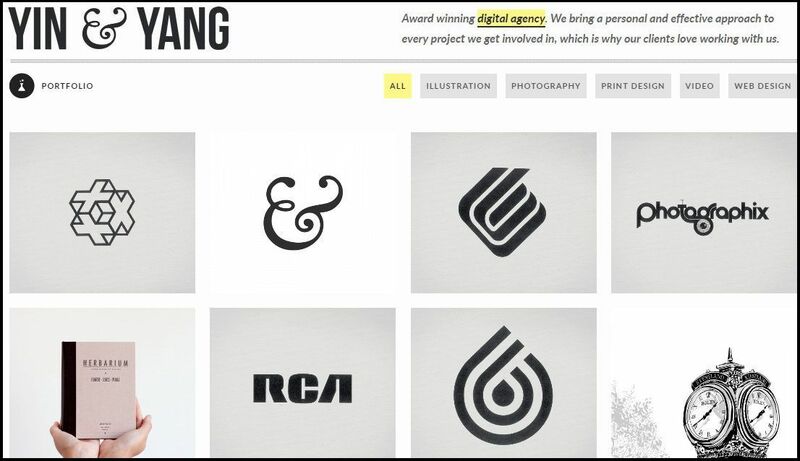 There are plenty of Creative Agency themes on the web. 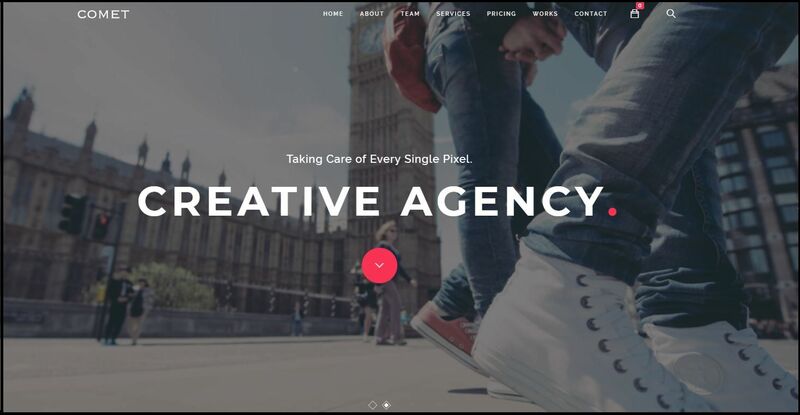 Here we bring you over 30+ of the Best Creative Agency WordPress Themes. Find the perfect creative WordPress theme for your website from the list below. It’s Creative Portfolio WordPress theme. Having 6 different animations for hover styles with position, color, border and image customizations. Also included 7 blog styles and 3 different pagination options. Minimalist WordPress theme with bold details and unique styling in all the right places. Furthermore it will highlight the content beautifully and grab the attention of visitors. BeOnePage is a professional one – page creative WordPress theme to promote your creative business. It is cross browser compatible, fully responsive, and retina ready. The theme performs beautifully on all devices, with smooth animations and optimum speed. A powerful theme for professional creatives. It also provides a large collection of carefully crafted elements, easily customizable templates and more. Native theme is the tool created for fast and convenient WordPress sites building. Various header styles and page templates are available for unexpected combinations and experiments. Similarly 60+ shortcodes and unlimited variations are available. Voxco is a theme for visionary creatives who want to make a statement with their website. 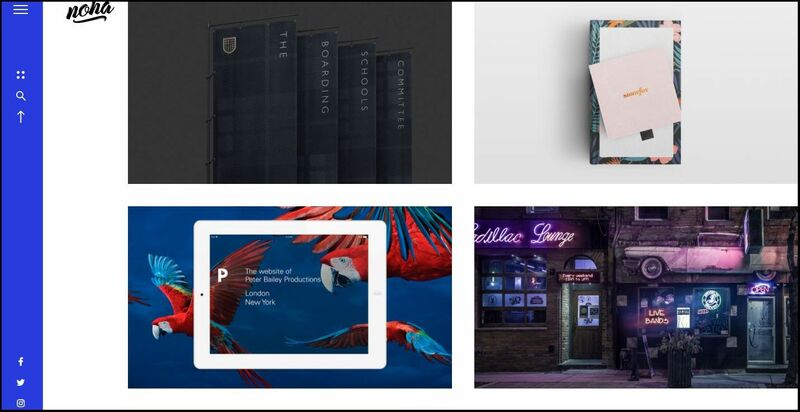 Also ideal for agencies and freelancers to impress and present their projects with style. Flatto is a beautiful, powerful Responsive WordPress theme for business or creative agencies. It is highly customizable with tons of features. Also modify the theme options and color theme to have your personalized WordPress theme. Kalium is a creative WordPress theme for your Portfolio, Agency, Photography, Corporate, etc. It is well organized, visually stunning and constantly evolving through theme updates. 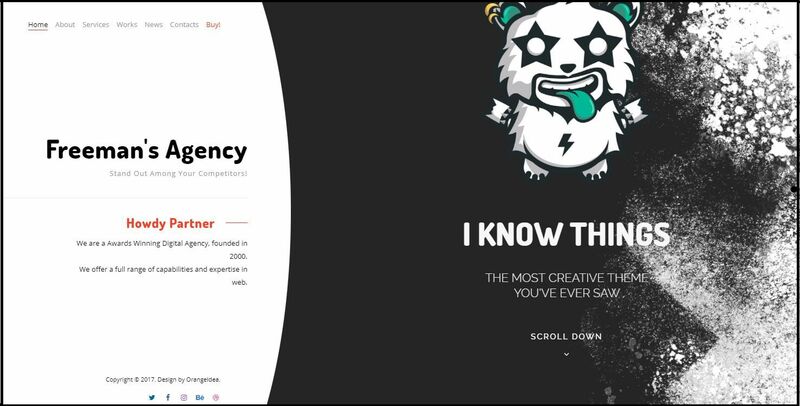 Overlap comes with unique layout designs for showing your creative portfolios. Theme also includes smart theme options to easily customize every aspect of your site. Easily create responsive pages and posts with the most popular Drag and Drop Page Builder, Visual Composer. Fully Responsive, Professional and Multipurpose Personal WordPress theme with scrolling page to showcase your top – notch portfolios. Theme suitable for those who need an easy, attractive and effective way to share their work. 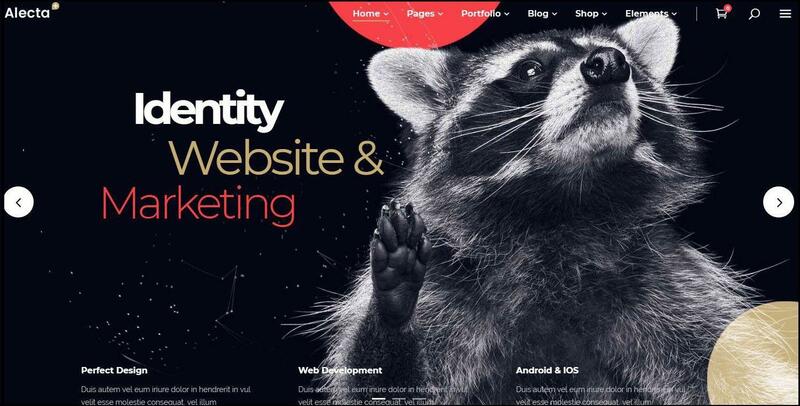 An awesome creative agency theme with a collection of beautiful, easily importable, fully customizable layouts homepage. Additionally it has Font Awesome, Font Elegant, Ion Icons, Simple Line Icons, Linea Icon Packs. Easily navigate to any section, since it supports Anchor functionality in menu. Uncode is a pixel perfect creative WordPress theme based on WPBakery Page Builder (Visual Composer). It’s clean and modern for agency, freelance, designer, web designer, developers, etc. Mood is build for any kind of project and let’s you showcase your work in a unique layout. Supports One page layout / Multi Page Layout. Also lots of options to customize your website easier. 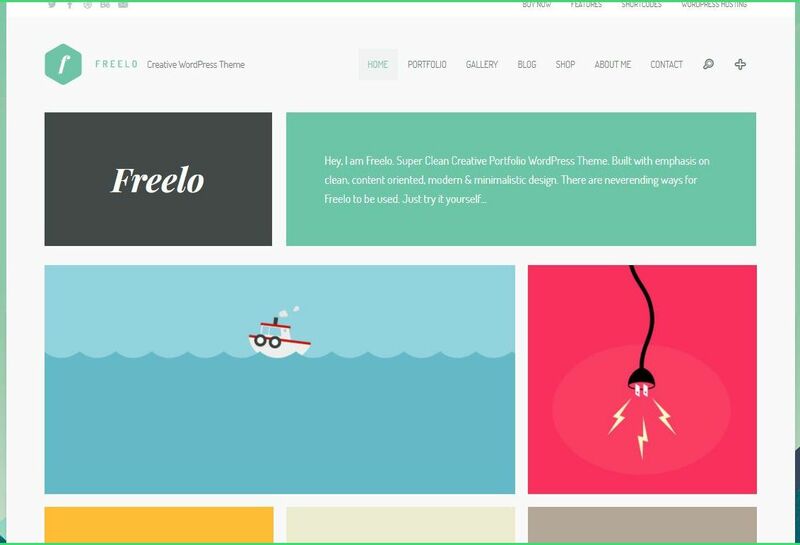 Freelo WordPress theme is perfectly suitable for freelancers, designers or any type of creative people. Includes 3 Portfolio View Styles: Masonry, Metro and Grid. Powerful WordPress theme designed in a clean and minimalistic style. Coded in HTML5, CSS3 and jQuery. It has a solid flexible responsive layout that scales from 320px to 1260px width all Bootstrap features. Nine Studio is suitable for any creative agencies / corporations and any kind of film websites. With a clean, elegant and modern design to promote and showcase your own workplace / products. A fresh WordPress theme for modern agencies and freelancers. Also control colors, fonts and most everything else. Setup your portfolio, agency or freelancer website with ease and unleash your creative potential. A creative and high performance WordPress theme. This theme is suited for photography, blogs, portfolios, agency, or any business. Ultimate agency and freelancer WordPress theme. 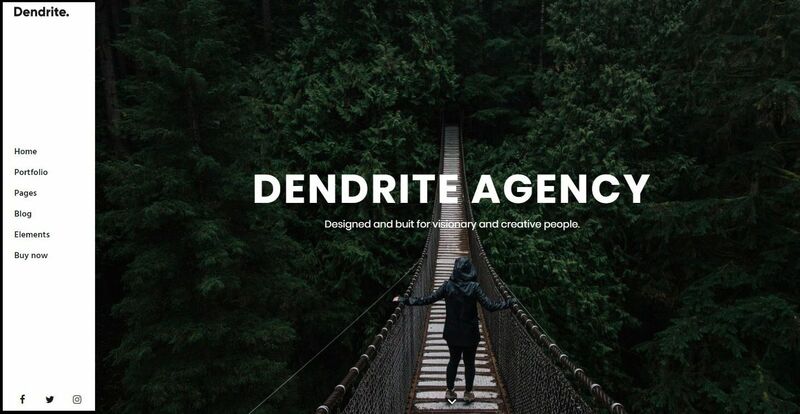 An alluring creative theme for Agencies and Freelancers. Smoothly is a premium WordPress theme for creative professionals, agencies, freelancers, illustrators, photographers etc. Moreover it also supports several 3rd party plugins that will enhance your website’s features and options. 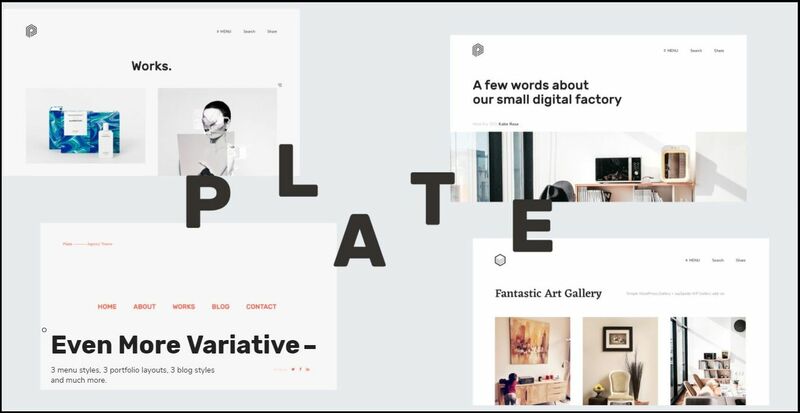 Plate is an agency theme for WordPress that was built for freelancers, designers and all creative folks. It’s unique, creative design with a huge attention to details and carefully crafted elements and features. Comet is a pixel perfect, fully responsive WordPress theme. It’s based on Visual Composer, the most popular WordPress page builder, and Bootstrap. Suitable for almost any kind of website: Blog, Shop, Agency, Freelance, Corporate, etc. Suitable for freelancers, agencies, photographers, bloggers, and anyone in search of a brilliant web presence. Its element options are vast, and were carefully designed, crafted, and positioned. Modern, responsive, clean and creative WordPress theme and is powered by AJAX. Creative portfolio and Agency WordPress theme focused on minimalism, elegance and simplicity. Agency is a responsive WordPress theme suitable for all kinds of agencies and digital marketing specialists. 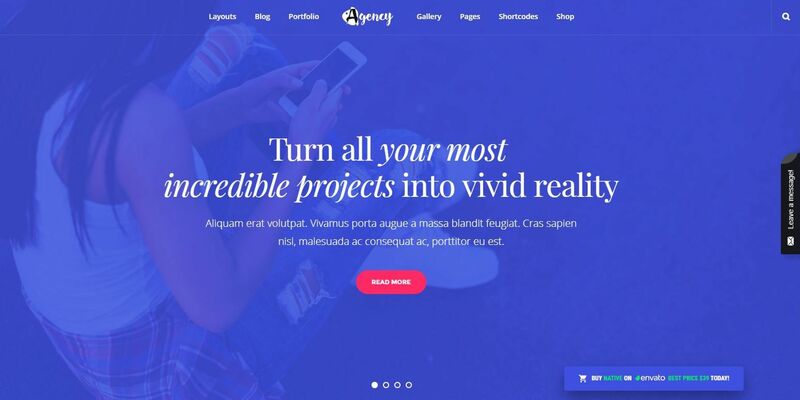 Create beautiful and meaningful websites with a wonderful UI/UX experience with Agency theme. Elston is visually stunning and impactful wordpress theme for creative and professional agency, portfolios. The design is more modern with wide functionalities and suitable for elegant and creative website seekers. Creative Agency and Presentation theme designed in a clean and minimalistic style. WordPress theme for creatives, built to showcase their portfolio, agency, studio or freelance work. In addition it has 12 pre – made homepages and 50+ purpose built section blocks. 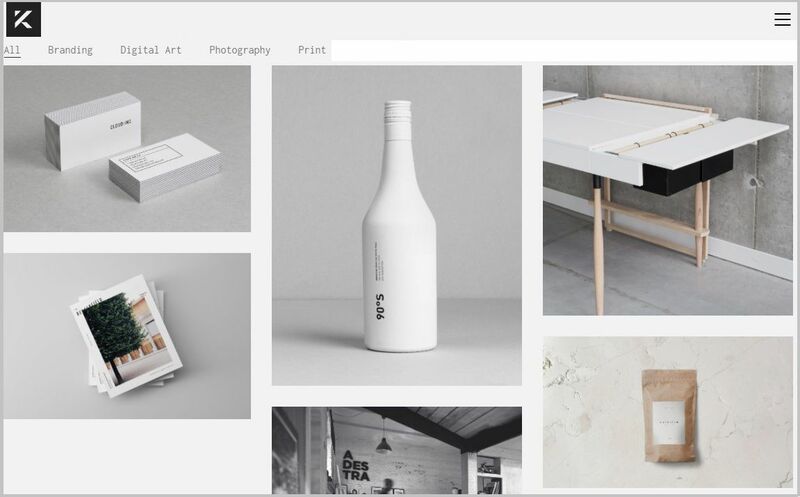 A pure minimal portfolio theme for creators to showcase their work in a beatiful eye – catching design. This theme is aimed at designers, illustrators and many or any other type of creative work. Unique and modern template for creative professionals, agencies, studios with multiple use. Great flexibility and power with the bundled and compatible plugins. Dendrite has unique design and powerful theme options. Also offers hundreds of creative elements to choose from. User friendly platform suitable for creative professionals, photographers, designers, bloggers and much more. A Creative Portfolio theme for Designers and Agencies. Flora comes with smart theme options so you can easily customize every aspect of your site with just a few clicks. A stunning, modern and responsive theme made specifically with creative agencies in mind. 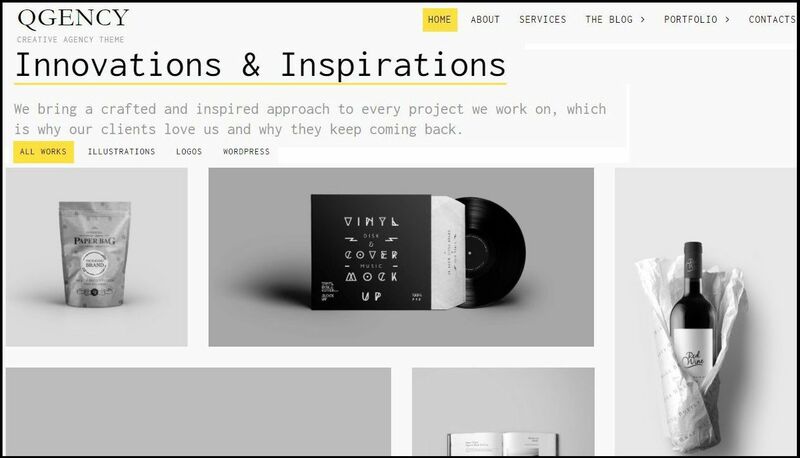 Grab these stylish WordPress themes and launch your new WordPress site quickly.